One day a friend of yours sends you a one line email saying, "Hey, check out FooBar!" That's all the message says. "Okay", you're wondering, "What the heck is FooBar?" You follow the link to the FooBar site, and all you can see is a EULA check box and a "Sign Up" button. You have no idea what FooBar does, so you're reluctant to entrust any information to this site. Before leaving, you notice a tiny link that says, "Learn more about FooBar". You click it, and are presented with the FooBar logo and a short paragraph that says that FooBar is pretty cool. You're still confused about what it does because you can't actually get inside and see it for yourself. Finally, overcome with curiosity about why your friend would recommend the site, you give in and click the Sign Up button. Once inside the site, you realize the site is stupid, and wish you'd never signed up. You later discover that all your friends have just received a one line email from you saying "Hey, check out FooBar!" This, in a nutshell, seems to be the experience of trying the typical Facebook app. Granted, in Facebook, the above experience would generally take place entirely within the world of Facebook (with its own messaging system, etc. ), but I think the story captures the basic pointless mystery of it all. I've been watching with interest how Facebook's application model will pan out, particularly the user experience of engaging with an application: discovering it, learning about it, adding it to one's profile, and using it. A while back I noted how many companies were busily removing hurdles at a site's entrance so people could experience a product's value (or at least a taste of the product's value) before committing to the product. Facebook, in contrast, seems to be confidently bucking this trend with the apps that live on top of its platform. On the one hand, Facebook users can quickly add a new app to their profile because they don't have to reenter personal information for each app. However, in my opinion, this advantage is overwhelmed by the de facto requirement that a user add a Facebook app to their profile before they can derive any meaningful value from it—or even understand what it does. If you do add the application, unless you're careful to uncheck "Publish stories in my News Feed and Mini-Feed", you'll end up telling all your friends that you've just added the app to your profile (in the manner of the original news feed entry shown above). The app has enlisted your unwitting help in perpetuating its pointless mystery. That mystery would, in fact, seem to be the basis for the viral distribution model of many Facebook apps. I have trouble with this approach, being founded on a disregard for a user's intelligence and precious time.This model relies entirely on mystery to entice you add the application—and then banks on the fact that, once you add an application to your profile, you'll just leave it there rather than remove it. This is fundamentally deceptive. That a Facebook app would hide information about itself suggests the app offers no persistent, real value. If it were actually valuable, the app would employ all the means at the disposal of a normal web site to balance the amount of value they provide to user with the degree of commitment they require from the user. For example, a normal site might let a curious potential customer: start a process but not finish it; read content but not write content; do something a fixed number of times; use the site for a trial period; perform certain basic operations but not other, more interesting ones; etc. Even the most brain-dead web site at least presents information about itself first, before making you sign up for the site. The first generation of Facebook apps generally forego all these techniques in favor of an all-or-nothing requirement that you add the app to your profile. 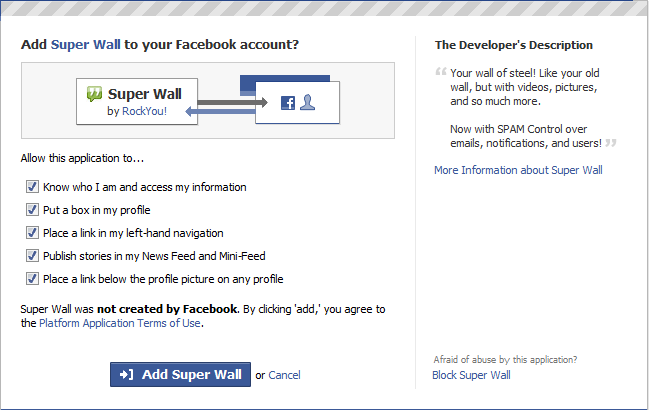 Remove a Facebook app you don't like is not hard, requiring a simple click on the little "X" in the app's profile box. Still, it's a tiny bit of work, and the work adds up with every app you try. I have to believe that most people will eventually tire of removing applications, and therefore tire of adding them. That in turn means the Facebook world is biased in favor of the first set of Facebook apps a user comes into contact with (i.e., all the apps used by their initial Facebook friends), and impairs the ability of later apps to succeed. I also find it hard to stomach the presumption that, when you add an app on Facebook, by default the platform and app presume to advertise that the app is now part of your identity. That's absurd. You haven't even seen what the app does. What else in the world works this way? When you pick up a book in a bookstore to consider buying it, are you really prepared to declare to everyone you know that you've picked up the book? 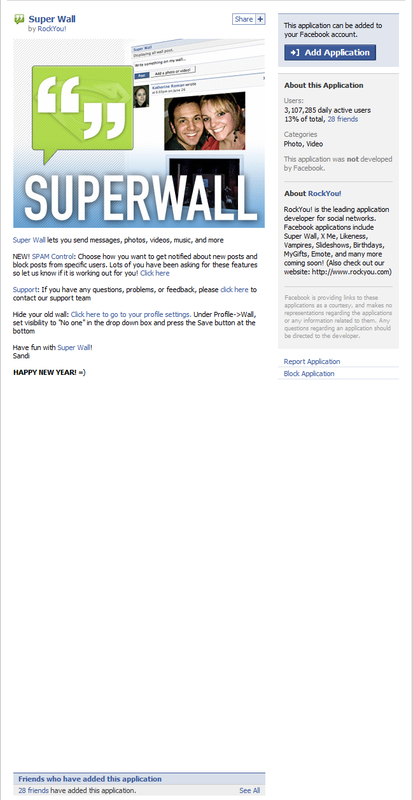 The news feed entries about adding applications seem like nothing more than spam. They do, however, also also serve Facebook's ulterior goal of giving every user the illusion of social activity, regardless of how many friends they have or how active those friends are. All the behavior described here appears to stem from a combination of deliberate platform limitations, unintentional platform limitations, de facto conventions that arose around the plaform's first apps, and plain bad design. A newer generation of apps do let you see a tiny bit of their functionality before you the add the application to your profile, but what you can see is generally still a very limited subset of what the app does. Regardless of their intent, it's fascinating to see Facebook facilitate such a closed app adoption model—and still create a successful and vibrant application platform. Clearly there are a huge number of people who don't mind (yet) adding unknown applications to their profile, nor do they mind (yet) advertising that fact to the world. What's odd is that those same users don't tolerate the same experience on every other web site. I'm hopeful those users will eventually turn away from Facebook's unnecessarily mysterious apps, and eventually force those apps to open their front doors as wide as the rest of the web. Last month I received a Microsoft Zune 80 as a gift. (Thanks, Johnny!) Having used the device for several weeks now, I wrote up some opinions of that experience to send to a friend on the Zune team, and have decided to share those thoughts here as well. My experience with Zune actually goes back a few months, to when I first subscribed to the Zune music service without actually owning a Zune device. I'm partial to having a music subscription rather than "owning" tracks. This is due to personal past experiences wrestling with DRM, and the sense of freedom I find in paying a flat fee for unlimited music. For $15/month I can listen to whatever I want within the reasonably spacious Zune Marketplace. In practice I could use the same amount to buy a big pile of audio tracks from iTunes, but for me a subscription enables a freer sense of experimentation. Case in point: a relative who visited over the holidays wanted to share music by an obscure Chilean musician. It felt great to listen to several esoteric albums through the subscription, and there's simply no way I would have felt good forking over money on the spot to listen to something I might never listen to again. Nevertheless, owning a Zune in an iPod world feels akin to belonging to an oppressed religious minority. Discussions about the Zune with fellow Zune owners must be conducted in secret, lest the conversation be overheard by the dogmatic iPod-wielding masses. This is too bad, since I found the second-generation Zune client software and the Zune device itself to work quite well in practice. I found it trivial to find new music, download it, and sync it to the Zune. YMMV. The original Zune client felt like a warmed-over skin for Windows Media Player, while the new one feels distinct enough to have its own style. The swirly background fractal may not be to your taste, but at least it's making a statement. I like it. A very subtle visual orange/pink gradient animates in the background at the bottom of the window when music is playing. I didn't notice this until I tried to take screenshots for the image above and compared them. It's similar to, but much more subdued than, the background effect in Windows Media Center. I assume the effect is there to confer a (slight) sense of movement. The UI makes extensive use of elements that come alive or reveal more detail on hover, such as scroll bars, the volume label, the device/disc/playlist icons in the lower left. The five-star rating system from Media Player always seemed to be more detail than I cared to supply. The Zune client replaces this with three simple states: neutral, I Like It, or I Don't Like It. The client makes good use of web-style navigation, a style I've referred to as a BBOP UI (Buttons, Back, One task, Page-based). My only complaint is that the little back arrow in the upper left disappears in the Settings area, which is treated like a giant modal dialog. I think that's a mistake—if you're going to offer web-style UI with a Back button, you really have to offer the Back button on every page, or you're really going to confuse the user. I can sympathize with the designers' dilemma, though. It's hard for client software designers to accept the fact that a user might want to walk away a page in which data has been entered—without making an explicit command to save their changes or cancel the operation. People do this every day on the web without issue. The Settings area should offer a Back button, and if the user happens to click it and loses it, so be it. That's how virtually all web pages already work. I was happy to discover that I could sync recorded TV shows from my Windows Media Center to the Zune. This worked well overall, even if video files did have to go through a slow conversion process. One annoyance was that the Videos view on the Zune client only shows the episode title, not the show title, air time, or episode description. This makes it hard to find the show you want to sync. I assume that essentially no time has been spent designing Zune and Media Center to coexist happily, and that minor issues like this will get resolved as Media Center integration improves in the future. I'm no hardware guru, but the Zune device itself seems well designed. The out-of-box experience was reasonable. The Zune 80 device itself is attractive and lightweight. The headphones seem better than most. My only complaint is that, like most headphones, you can't tell the Left and Right phones apart without looking closely at them to find a tiny "L" or "R". It would be great if one could feel which one was which through some means (a raised letter, dots, whatever). Interestingly, the Zune cable already does something similar: there's a raised bump on one side of the connector so you can tell which of the otherwise identical flat surfaces on the connector needs to be facing up as you plug it in. Just once I wish I could buy a device with an expensive screen that came with its own cheap plastic stick-on screen protector in the box, instead of having to hunt for an aftermarket screen protector myself. The software on the Zune device also looks and feel pretty good. The touchpad is an elegant way to scroll up and down through lists—while allowing you to navigate laterally across lists to the left or right. The UI uses animated transitions to good effect. I wish the Zune device UI weren't quite so minimalist. It feels like Microsoft is trying to out-minimize Apple by pursuing Apple's desire for a UI that's clean to the point of inscrutability. Case in point: I couldn't find the UI for turning on Shuffle. Through trial and error I discovered that pressing the middle of the touchpad brought up a context menu of sorts which included the Shuffle command. If hardware buttons must be context sensitive to keep down the number of buttons, I always appreciate an on-screen indication of what they're going to do if I press them now. Windows Mobile does a decent job of this by always showing what the two soft buttons directly below the screen will do. I'm really curious about the decision to have the main menu scroll. In the above image, you can see that the designers have very carefully sized and positioned the menu items so that one item ("podcasts") is clipped at the bottom of the screen. This is a great way to indicate that the user can scroll down to see more items without having to resort to a heavy-handed scroll bar. Very elegantly done, yes? So, how many additional menu items do you think you will gain access to if you scroll down? One. One! If you scroll down, you'll see one more item ("settings"). I'd be inclined to dismiss this as insanity, if it weren't for the careful attention to detail here. It would have been trivial to position and size the text slightly differently to get all the text to fit on the screen without scrolling. More to the point, it would have a been a lot easier to develop. I can only conclude that making the menu feel more dynamic (by forcing the user to scroll) felt better than offering a completely static menu. The Photos area was fine, but I was disappointed the device doesn't include a rotation sensor like the iPhone (or most modern digital cameras). This means that, when looking at photos, valuable screen real estate is often wasted, and pictures are shown at a size smaller than that of the screen. 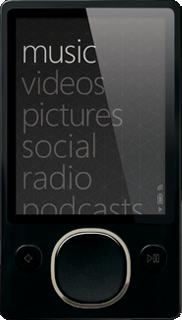 The Zune offers a modest personalization option: you can set the background of the main menu to a photo. Surprisingly, that was entirely sufficient for me to feel like I'd made the device mine. Many other devices do this, of course, but here the trick felt a particularly effective because the main menu itself is so minimal. The Zune client incorrectly catalogued a few albums under the wrong artist. This appears to be a bug introduced during the upgrade from Zune 1.x to Zune 2.0. I was puzzled why the Zune client doesn't offer a context menu on every UI element a user might conceivably want to right-click on. There are no context menus on many online store data elements, for example. A UI that makes inconsistent use of context menus can be pretty frustrating, here all the more so because context menus are a nearly perfect way to offer a rich set of commands without cluttering the UI. I'd prefer a Now Playing area in the client that showed what was playing without a distracting album art visualization. The Zune Marketplace often appears to get confused as to which online tracks are already in my collection. The client frequently hiccups when I move between PCs. One of the major benefits of a music subscription is being able to move from one PC to another and not have to go through the absurd exercise of copying massive piles of audio bits everywhere I want to listen to music. The Zune client sometimes gets confused if I switch PCs and try to listen to music through the subscription. Signing out and back in always fixes the problem, but that's an irritating workaround. I'm hoping the client will eventually do a better job of automatically signing in whenever one switches to a different PC. I had trouble syncing over WiFi: nothing would happen, or else I would see a cryptic error message. I eventually discovered that the error message would go away if I got closer to the wireless router, so presumably the error message was just a (very bad) way of saying the WiFi signal wasn't strong enough. The aforementioned Settings area pegs its buttons to the lower right, which is a bad idea. On a large monitor, these controls all but disappear in a distant corner of the screen, far from the content they pertain to. This common UI flub occurs when designers optimize too much for a specific window size. While home videos on my local PC show up in the Zune library, videos on a networked PC don't show up at all, with no explanation. I still can't figure this out. The Zune would make for a decent podcast player—if it weren't for a crippling bug: the Zune sometimes (randomly?) forgets what portion of the podcast already I've listened to. For me, being able to Resume a paused podcast is the feature that distinguishes a music player from a podcast player. The unreliability of this feature on the Zune nearly wipes out it's value as a podcast player. Both the Podcast and Videos areas are missing a crucial feature: the ability to remove a podcast or TV show when you're done listening or watching to it. A list of podcasts isn't like a list of songs you want to listen to over and over. It's more like a To Do list of things you want to listen to once. It's tedious to have to go back to your PC just to remove a podcast you've listened to or a TV show you've watched. Overall, I'm pretty happy with my Zune 80. As a music player for an online music subscription service, the Zune works nearly flawlessly. It's less effective as a podcast or video player, but I'm looking forward to seeing those deficiencies addressed. I'm not sure what Microsoft can do about Zune's biggest handicap: its brand. People like buying Apple products because of what they feel the purchase says about them. At this point, buying a Zune either tells people that you're a Microsoft-loving sap, or else so uninformed as to be unaware that you've just purchased a second-place music player. Virtually all of this bad vibe is attributable to the unshakable feeling that Microsoft is trying too hard to be cool. I actually think Microsoft has made some bold and innovative moves in designing and marketing the Zune, but all that works has to fight against the grain of the intrinsically uncool brand of Microsoft itself. And for what? I can't think of a single way in which the Microsoft brand has helped the Zune in any way, and one can only wonder how much more successful the Zune would be if it had been marketed as a completely independent entity. To their credit, the Zune folks at Microsoft are painfully aware of this enormous marketing handicap, and I wish them the best of luck overcoming it. In the meantime, I'll be happily listening to all the music I can eat on my Zune.